James Keatings scored a hat-trick as Scottish Championship leaders Hearts made it three wins out of three by beating Raith Rovers. The former Hamilton player netted twice before the break, slotting home from 12 yards and then beating two men to fire his second. And the 22-year-old completed his treble with a free-kick. 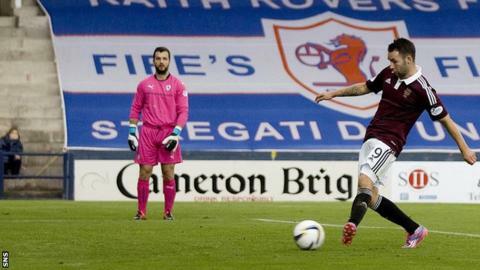 Substitute Gary Oliver completed Raith's misery with a close-range effort in the final minute. Match ends, Raith Rovers 0, Hearts 4. Second Half ends, Raith Rovers 0, Hearts 4. Attempt blocked. Alistair Roy (Hearts) right footed shot from the centre of the box is blocked. Goal! Raith Rovers 0, Hearts 4. Gary Oliver (Hearts) right footed shot from the centre of the box to the bottom right corner. Attempt saved. Christian Nade (Raith Rovers) header from the centre of the box is saved in the centre of the goal. Ross Perry (Raith Rovers) wins a free kick on the right wing. Foul by Alistair Roy (Hearts). Ryan Conroy (Raith Rovers) hits the right post with a header from the centre of the box. Lewis Vaughan (Raith Rovers) wins a free kick on the left wing. Substitution, Hearts. Alistair Roy replaces James Keatings. Attempt missed. Grant Anderson (Raith Rovers) header from the centre of the box misses to the left following a set piece situation. Corner, Raith Rovers. Conceded by Jack Hamilton. Attempt saved. Lewis Vaughan (Raith Rovers) right footed shot from a difficult angle and long range on the left is saved in the centre of the goal. Danny Wilson (Hearts) is shown the yellow card. Substitution, Hearts. Gary Oliver replaces Morgaro Gomis. Substitution, Raith Rovers. Lewis Vaughan replaces Liam Fox. Attempt missed. Kevin Moon (Raith Rovers) right footed shot from outside the box is just a bit too high. Attempt saved. Ryan Conroy (Raith Rovers) right footed shot from very close range is saved in the centre of the goal. Foul by Alim Ozturk (Hearts). Corner, Hearts. Conceded by Paul Watson. Substitution, Raith Rovers. Kevin Moon replaces Mark Stewart. James Keatings (Hearts) wins a free kick in the attacking half. Goal! Raith Rovers 0, Hearts 3. James Keatings (Hearts) right footed shot from very close range to the top right corner following a set piece situation. Sam Nicholson (Hearts) wins a free kick in the defensive half.